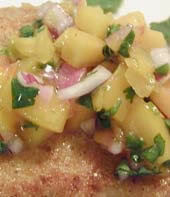 Peach salsa is great way to jazz up chicken or fish. It’s sweet and sassy and very easy to make. The peach salsa can be made in advance, but is best used the day it is made. Toss peaches, onion, cilantro, lime juice, jalapeño and sugar in a medium bowl until well combined. Refrigerate in a covered container until ready for use. Combine flour, breadcrumbs. cornmeal, salt and chili powder in a medium bowl until well blended. Lightly flatten chicken breasts with the smooth side of a meat pounder. Heat peanut oil in a large skillet over medium-high heat. Dip the chicken breasts in a bowl of cold water, then dredge them in the cornmeal mixture. Carefully place chicken breasts in the skillet. Reduce the heat to medium. Cook until golden brown, turn and brown the other side of the breast, about 4-5 minutes on each side. Remove chicken breasts from skillet and allow to drain on paper towels. If necessary gently blot the top of the breasts to remove excess oil. Spoon the peach salsa over the chicken and serve immediately. This entry was posted on Thursday, September 6th, 2007 at 7:29 am	and is filed under Carnivore, Main Dishes, Master Recipe Index. You can follow any responses to this entry through the RSS 2.0 feed. You can leave a response, or trackback from your own site.